We’ve heard that necessity is the mother of invention, and this is especially true for chefs who cook with seasonal ingredients. 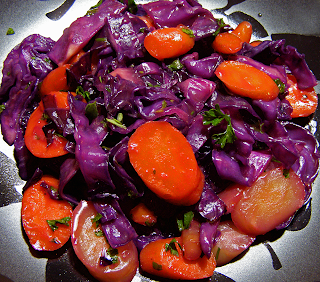 I invented this recipe one winter with leftover purple cabbage and carrots, and used it again for our veggies this week. I like the way the purple cabbage intensifies the color of orange carrots, but you could substitute red or yellow carrots or green cabbage. The purple cabbage makes this a prettier dish than green cabbage, though. I like to drain an 8 oz can of pineapple for the juice. My husband loves eating the pineapple chunks for dessert! If you feel experimental, you could try adding some pineapple to the dish itself along with the pineapple juice. You might have to add a little extra cornstarch too, depending on the amount of pineapple you add. This recipe can easily be doubled. In that case, you can drain a 14 or 20 oz. can of pineapple for the juice. Cut carrots into ¼-inch diagonal slices. Place cabbage cut-side-down on cutting board. Cut in half crosswise, then cut each half into thin slices. Heat a nonstick pan or electric frying pan to medium. Add oil and butter. When butter melts and makes tiny bubbles, add carrots. Cook 10 – 15 minutes on medium, stirring every few minutes, till carrots are medium-done. Stir in Spike or equivalent seasoning. Add lemon juice, pineapple juice, and honey. Toss in cabbage and continue heating and stirring up cabbage and liquid from bottom of the pan so cabbage cooks evenly, for about 4 minutes. Pour in cornstarch that has been dissolved in water. This works best if you pour the cornstarch into the liquid, not on top of the cabbage. Stir in the cornstarch. Cook for 5 more minutes, stirring constantly until sauce is slightly thickened and clear, stirring up cabbage from the bottom so it cooks evenly. Stir in green herbs, heat through, and serve.